Willie Mullins' incredible 11-year-old was bidding to make it 10 starts unbeaten at his beloved Leopardstown and claim a 22nd victory at Grade One level. For much of the journey it appeared unlikely, however, with Ruby Walsh getting lower in the saddle in the back straight to keep the 11/10 favourite in touch. With the pacemaking Plinth fading, last year's Champion Hurdle hero Jezki took over from the home turn, with Hurricane Fly responding to Walsh's urgings on the inside of the track. To the delight of the packed grandstands, Hurricane Fly galloped all the way to the line to seal yet another momentous triumph. His stable companion Arctic Fire came through to deny Jezki the runner-up spot. The score stood at four-two in favour of Hurricane Fly heading into their seventh battle, but the prospect of a sounder surface gave connections of Jezki confidence the Cheltenham hero could gain his revenge. Plinth, employed by Jezki's owner JP McManus as a pacemaker, was struggling to get to the front from the outset and it was inevitable he would eventually capitulate. Jezki cruised to the lead at the second-last, but Hurricane Fly, who himself appeared to be finding the gallop a little too hot for much of the way, was typically dogged and clawed himself back into the race. It seemed that Hurricane Fly would win the argument when he managed to get back on terms as the final flight loomed and Jezki's error sealed his fate. Arctic Fire, third behind the big two in the Ryanair Hurdle at Christmas, ran a largely similar race having been held up by Paul Townend. Walsh said: "He didn't travel with the same fluidity as he has done in the past today, but I suppose when the going got a little bit tougher going to the second-last he started to pick up. 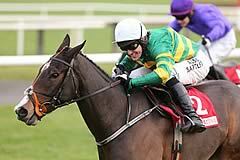 "When he rounded the bend and I got to AP (McCoy, on Jezki) I was thinking 'how much is he going to find? ', but when I saw AP go for his whip I knew I had him covered. 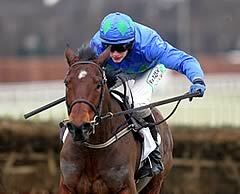 "I was going as fast as I was able - as fast as he (Hurricane Fly) wanted to go, anyway. I was struggling. "It was the outside track, we didn't go mad early and they stepped up down the back to draw the sting out of us. It was a testing race. "When I got more aggressive with him, he started to pick up and when I got on to AP's tail, he stuck his head down like he always does." Walsh is confident Hurricane Fly had Jezki's measure when the latter made his mistake. He said: "He gave me a brilliant jump at the last. Obviously Jezki stepped into it and missed it and that probably enhanced the margin we won by, but he's an incredible horse. "I jumped the last well and going on past performances, he wasn't going to shirk the issue from there home."